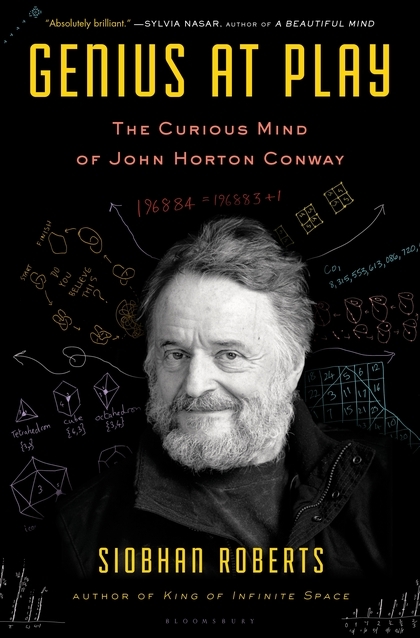 Someone called James Davis has found a counterexample to John H. Conway’s “Climb to a Prime” conjecture, for which Conway was offering \$1,000 for a solution. Let $n$ be a positive integer. Write the prime factorization in the usual way, e.g. $60 = 2^2 \cdot 3 \cdot 5$, in which the primes are written in increasing order, and exponents of $1$ are omitted. Then bring exponents down to the line and omit all multiplication signs, obtaining a number $f(n)$. Now repeat. So, for example, $f(60) = f(2^2 \cdot 3 \cdot 5) = 2235$. Next, because $2235 = 3 \cdot 5 \cdot 149$, it maps, under $f$, to $35149$, and since $35149$ is prime, we stop there forever. The conjecture, in which I seem to be the only believer, is that every number eventually climbs to a prime. The number 20 has not been verified to do so. Observe that $20 \to 225 \to 3252 \to 223271 \to \ldots$, eventually getting to more than one hundred digits without reaching a prime! Well, James, who says he is “not a mathematician by any stretch”, had a hunch that a counterexample would be of the form $n = x \cdot p = f(x) \cdot 10^y+p$, where $p$ is the largest prime factor of $n$, which in turn motivates looking for $x$ of the form $x=m \cdot 10^y + 1$, and $m=1407$, $y=5$, $p=96179$ “fell out immediately”. It’s not at all obvious to me where that hunch came from, or why it worked. The number James found was $13\,532\,385\,396\,179 = 13 \cdot 53^2 \cdot 3853 \cdot 96179$, which maps onto itself under Conway’s function $f$ – it’s a fixed point of the function. So, $f$ will never map this composite number onto a prime, disproving the conjecture. Finding such a simple counterexample against such stratospherically poor odds is like deciding to look for Lord Lucan and bumping into him on your doorstep as you leave the house. A lovely bit of speculative maths spelunking! via Hans Havermann, whom James originally contacted with his discovery. One problem: that’s Wolfram’s Rule 135, not the Game of Life. You can tell because of the pixels. Rule 135 is a 1-dimensional automaton: you start with a row of black or white pixels, and the rule tells you how the colour of each pixel changes based on the colours of the neighbouring pixels. 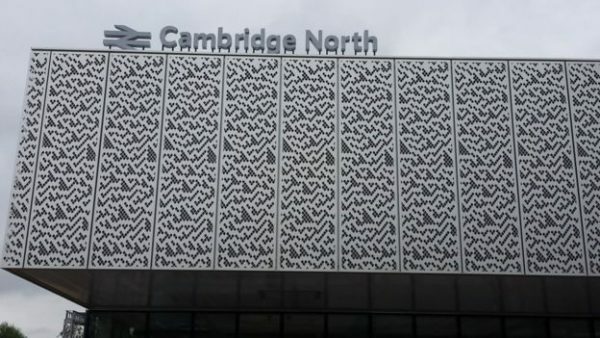 The Cambridge North design shows the evolution of a rule 135 pattern as a distinct row of pixels for each time step. Conway’s Game of Life follows the same idea but in two dimensions – a pixel’s colour changes depending on the nearby pixels in every compass direction. Either way, it’s a lovely pattern. I suspect the designers went with Rule 135 instead of the Game of Life so that they’d get a roughly even mix of white and black pixels, which is hard to achieve under Conway’s rules. Delayed £50m Cambridge North railway station opens on BBC News. Cambridge North Station information from Atkins Group, the design consultancy responsible for the station building. Press release from Greater Anglia trains. The Game of Life: a beginner’s guide by Alex Bellos in the Guardian. Brought to our attention by @Quendus on Twitter. Just how big is a big proof? With news that a recent proof of the Boolean Pythagorean Triples Theorem is the ‘largest proof ever’, we collect and run-down some of the biggest, baddest, proofiest chunks of monster maths. 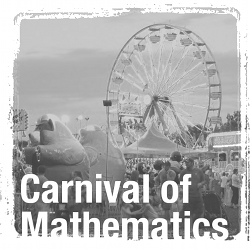 Featuring on their blog as the inaugural post under the optimistic tags ‘math‘ and ‘John Conway‘, they explain that three maths puzzles set by Conway will be posted on Pi Day, “varying in level of difficulty from high school to Ph.D. level”. Residents of the 48 contiguous US states can leave their answers in the comments when the puzzles are posted, and the winners receive a 3.14-year supply of pizza (or, as the rules clarify, a somewhat more prosaic $1600 Pizza Hut gift card). Obviously we will have to wait for the questions to be unveiled to be able to judge the appropriate level of excitement for this promotion, but with Conway involved, no maths-is-really-hard nonsense in the blog post, and not a formula for the perfect anything in sight, things are looking promising for a nice bit of harmless maths/poor childhood diet fun. The author Siobhan Roberts has sent us a copy of her new book, Genius at Play. There was a strong implication that we should review it. I’ve now read the book, so I’ll do that: I enjoyed it. Numberphile, the supremum over all YouTube channels, has scored a bit of a coup – Brady has sat down and recorded an interview with the famously Internet-reclusive John Conway. In this first video (there’s a bonus one linked at the end of this one, and I hope there’ll be more) John talks about his love/hate relationship with his Game of Life. By the way, I notice from the video’s description that the Mathematical Sciences Research Institute is paying for Numberphile these days. Thanks, MSRI!